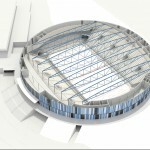 The knowledge acquired during the planning of the ice rink in Wolfsburg and der ice rink in Cologne is being implemented in the new design for an ice rink in Bietigheim-Bissingen, close to Stuttgart, in Germany. 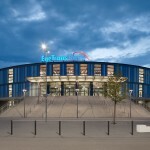 The entrance of the round ice rink is orientated to the south-east, defining a generous space used as an entrance area between the new ice rink, the old ice rink, and the neighboring swimming pool. 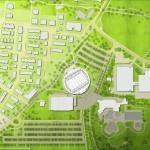 Due to the proximity to the old ice rink, both ice rinks are easily accessable. 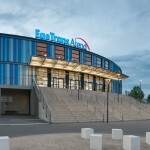 Furthermore, new energy efficient ice technology sutuated in the new ice rink can be used to in the old ice rink. 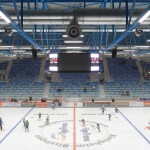 The ice rink is designed for a capacity of 4.500 spectators, which is required to comply with the German icehockey league standards. Due to the round form of the ice rink, the ratio of the facade and the enclosed volume is minimized, thus preventing energy losses through the facade reducing overall energy consumption. 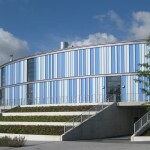 The design of the building‘s roof structure was optimized to reduce the steel consumption to a minimum with only approx. 65-70kg/m2.